So you’ve got the legal part down and you’ve booked your flight. What’s next? Follow these 8 travel tips to make the most of your trip to Cuba. 1. Keep your boarding pass. 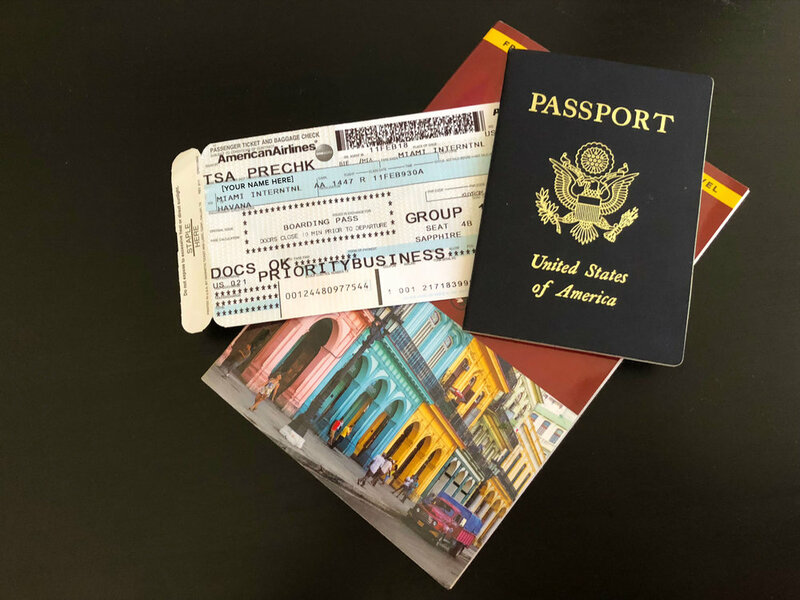 Direct commercial flights from the United States include Cuban health insurance. The stub of your boarding pass serves as proof of this insurance. Keep it with you in your wallet or purse. Take a photo of it and a photo of your passport so you’ll have both right on your phone. Should you require medical assistance, go to Cuban tourist hospital Clinica Central Cira Garcia located at Calle 20 #4101 on the corner of Avenida 41. Treatment is adequate but slow. If you’d like to buy supplemental health insurance, U.S. companies like GeoBlue provide Cuba coverage. 2. Do not lose your “Cuban tourist visa”. When you enter Cuba, Cuban immigration will ask to see your Cuban tourist visa. Immigration will stamp it and hand it back to you. You must save this document for the duration of your trip and provide it to immigration when you leave the country. Do not lose your visa! If you lose it, you will face delays and may miss your flight. 3. Bring cash (USD or Euro) and exchange at the airport. Cuba is cash only. U.S. credit and debit cards do not work in Cuba. Bring more cash than you think you’ll need to avoid any issues. Exchange money at the airport where lines are typically shorter. Check the CADECA (exchange house) upstairs on the departures floor if the line downstairs at arrivals is long. However, beware that the CADECA upstairs may run out of cash, and they may direct you back downstairs. The type of currency you bring (USD vs. Euro) has advantages and disadvantages. USD is more convenient. Euro can save you about 5%. 4. Avoid WIFI… but if you need it go here. Part of the magic of Cuba is the opportunity to truly detox from all things digital. When is the last time you were able to put your phone away for days at a time? Avoid WIFI and embrace the digital detox! If you do happen to need fast and reliable WIFI, go to the business center on the second floor of the Hotel Nacional and connect for 5 CUC per hour. If you need a quick fix to post photos or touch base with home, head to the nearest hotel lobby and ask the front desk for a WIFI card. Hotel Parque Central in Old Havana is a great option, with its spacious lobby and reliable connection. However, please note that WIFI cards purchased at Hotel Parque Central will only work in the hotel, not in the WIFI parks or at other hotels. 5. Drink bottled water only, and lots of it! The most common health issue in Cuba is probably dehydration, especially for travelers planning to enjoy a few mojitos. Fend off traveler’s diarrhea by sipping on a large 1.5L bottle of water at all times. Finding bottled water in Cuba isn’t always easy. The best time to stock up is right after leaving the airport. Ask your driver to take you to a local store and buy enough bottled water for the duration of your stay. Never drink the tap water. 6. Use roaming text messages. For ~$0.50 per incoming and outgoing message, you may use text roaming on your U.S. mobile phone. Check with your carrier to confirm the current rates. Roaming text messages are a great way to stay in contact with traveling companions while in Cuba. Text roaming also allows you to send and receive texts to and from the United States. IMPORTANT: Do not use data roaming or voice roaming in Cuba. Both are extremely expensive and could lead to huge bills from your carrier. 7. Tip 10% at restaurants. While there isn’t a hard and fast rule for tipping at restaurants in Cuba, take pride in knowing that a little bit goes a long way. Feel good about supporting the Cuban people with a generous 10% tip at all restaurants. It will be strongly appreciated. Some restaurants already include a 10% service charge on your bill. In this case, it is not necessary to leave an additional tip. 8. Travel with CUBA CANDELA. Allow us to plan your dream vacation to Cuba. We specialize in highly curated private journeys for couples, families and affinity groups. Read our reviews to hear from prior guests!